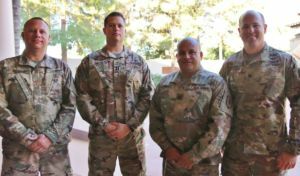 With a multitude of programs and giving initiatives, Military Assistance Mission (MAM) provides financial and moral support to Arizona’s active duty military, their families and post-9/11 Purple Heart recipients. Financial support includes paying for items such as rent, mortgage, car payments and insurance, and utilities for their lowest-ranked service members. GIGG – This GI Gap Grant helps transitioning active duty and reserve service members with financial aid for the gap in between service and college while waiting for the first GI Bill payment to come in. Seats for Soldiers – The Arizona Cardinals and the Arizona Diamondbacks provide specials seats and recognition at a game. Sanderson Ford Classroom – MAM holds free classes for service members, veterans and their spouses with a variety of topics from financial guidance and tax preparation, to resumé writing, car maintenance, and more. Back 2 School – Every summer MAM organizes a drive to collect school supplies for military children in Arizona to ensure that they are able to go to school in the fall with the same supplies as their civilian classmates. Work for Warriors – MAM partners with, and helps facilitate employment, with veteran-friendly companies whose goal is to hire heroes.